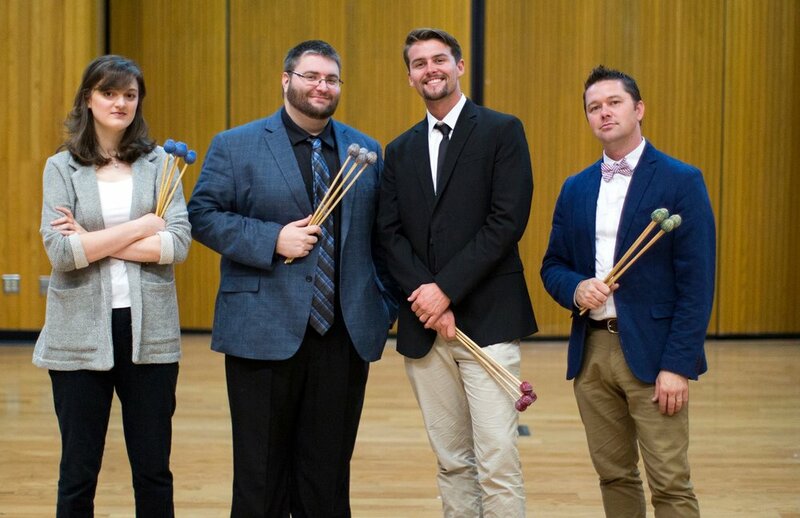 Left to right: Peyton Esraelian, Robert Strong, Sean Clark, and Michael Downing of the Orphiq Quartet. Musicians Sean Clark, Michael Downing, Peyton Esraelian and Robert Strong are the Orphiq Quartet. The Fresno-based group performs internationally and seeks to share its love of percussion chamber music with audiences everywhere. They enjoy working with composers on new pieces and like to perform standards as well. Sean Clark is currently attending Fresno State University, where he is working on a bachelor’s degree in instrumental music education. He splits his time among several projects and ensembles including Orphiq, the Fresno State Percussion Quartet and the New Arrivals Duo. Michael Downing is section percussionist with the Sacramento Philharmonic and the Stockton Symphony. He is the adjunct professor of percussion at Fresno Pacific University and holds a master’s degree and a bachelor of arts degree from Fresno State. Peyton Esraelian is a recent graduate of Clovis Online High School and has been a member of the Fresno State Percussion Ensemble and New Music Ensemble since 2015. She is the principal percussionist with the Fresno State Symphony Orchestra. Robert Strong is a percussionist, composer and educator based in Clovis, California. He studied music performance under Dr. Matthew Darling at CSU Fresno. From 2014 until 2017, he served as director of percussion studies at the Regan Educational Center in Clovis. He is currently a member of the Impetus Percussion Quartet, Orphiq and Clovis Wind Symphony. Visit the Orphiq Quartet's website to learn more.